Applications for 2016 CPAC Awards/Scholarships are now closed. We will notify all the winners by middle February, and the Scholarship Award Ceremony will be held on March 5, 2017. November 22, TORONTO – CPAC Foundation announces today that the Foundation’s 2016 Awards and Scholarships are open for application immediately until January 31, 2017. Presentation of these prizes will be held in early March 2017. Awards: The CPAC awards are designed to encourage Ontario high school students to pursue higher education. Applicants must demonstrate outstanding academic achievements and active community involvement. There will be a maximum of six $1,000 awards for students who have completed grade 10, 11 or 12 studies, with a maximum of two awards for each grade. The CPAC Special Scholarship is awarded to an outstanding high school or post-secondary student that played an active and leading role in a meaningful project or initiative in relation to environmental and wildlife based social justice issues. The value of this Special Scholarship is also $3,000. Two scholarships of $3,000 each are available for post-secondary students who have maintained a minimum average of 70%, demonstrated social responsibility as well as a determination to pursue academic excellence, and shows a financial need. The deadline for application is January 31, 2017. CPAC Foundation welcomes applications from Canadian citizens, immigrants and international students with CPAC student membership of all ethnic backgrounds. 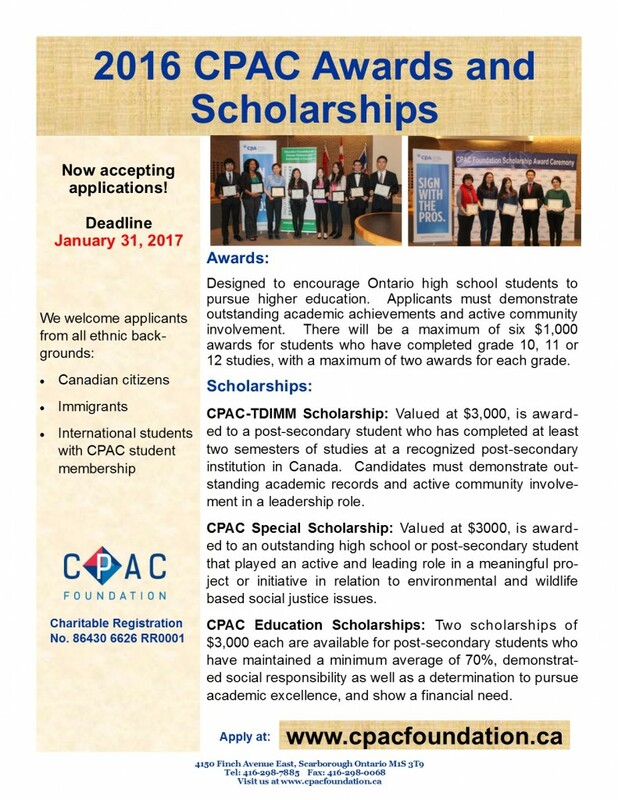 Previous CPAC Award/Scholarship recipients are not eligible to apply for the same category again. Previous CPAC Bursary recipients are eligible to apply for any scholarships. For further information, please visit CPAC Foundation’s website at www.cpacfoundation.ca, or contact the CPAC office at 416-298-7885. Founded in 1999, the CPAC Foundation is a registered charity that raises funds in support of CPAC’s work within the immigrant community and also the Foundation’s own education related initiatives.